"Candling" an egg is the process of holding a light or candle near the egg to see the inner contents. It is used to see whether the egg is fertile or not. Looking at the color, shape, and opacity of the egg contents can help a farmer determine whether there is a chick inside or not. Small farmers who are incubating eggs to hatch chicks for their laying flock on their farm will need to candle the eggs periodically to check to make sure they are fertilized and growing well. Unfertilized eggs, called "yolkers," or embryos that have stopped growing, called "quitters," will rot, stinking up your incubator. They may also burst, contaminating the other eggs with bacteria. It is also helpful to check on the eggs to see how the embryos are progressing. If you're selling eggs on the small farm, you may candle your eggs to determine their freshness. In this case, you will use a bright light, but just inspect the size of the air sac. Older eggs have larger air sacs. Selling only the freshest eggs is an important part of a small farm egg business, along with cleaning, collecting and properly storing the eggs. You will need a bright light to look at your eggs, and your room will need to be dark. Poultry supply or farm supply stores sell egg candling devices, but you can also make your own. Take a 60 watt light bulb and a coffee can. Make a hole with a one-inch diameter in the top. You could also take a bright flashlight and cover the opening with a piece of cardboard that has a one-inch diameter hole cut in the middle. Specialty candling devices like the Ovascope can make the process of candling a lot simpler and more time-efficient, especially helpful if you are hatching lots of eggs. Gently pick up one of the eggs and hold it up to the light, without looking directly at the light. Hold the larger end of the egg against the light, turning it slowly. Look inside the egg to observe the embryo inside. Be sure not to hold the egg against the light too long as you don't want the embryo to get too hot. When you've finished inspecting the egg, gently place it back in its spot in the incubator. Avoid having eggs removed from the incubator for more than twenty to thirty minutes. "Winners," or fertilized, growing embryos, can be identified by a visible network of blood vessels if you're looking within the first week or at day seven. After that, you can see the eye, a shadow that indicates its body, and possibly even movement. "Quitters," embryos that stop growing, will show a thin, red ring around the yolk. They may also show blood spots or streaks, though it can be hard to distinguish these from growing embryos. Remove these from the incubator. "Yolkers," eggs that never got fertilized properly, will show no blood vessels, no ring, no spots in the yolk. Remove these from the incubator and throw them away (not good for eating). 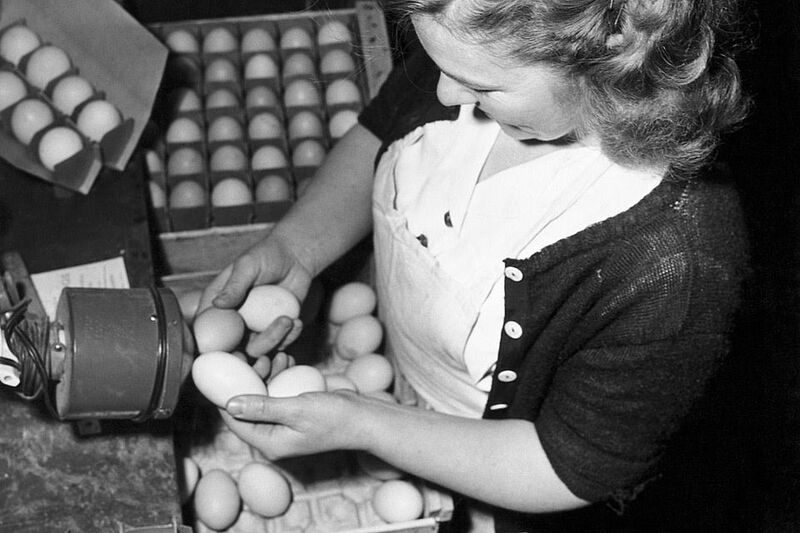 Record your observations in a notebook, numbering each egg. If you are unsure whether an egg is a winner or not, place it back in the incubator, but make note of the number so you can check it again. It's a good idea to candle your eggs before you even place them in the incubator. This will give you a baseline to compare to when you look later. You can also check at this time for cracks in the eggshells, which may allow bacteria inside that could contaminate the embryo and affect its development. Don't discard eggs with cracks, but the record which ones they are so you can be sure to monitor them more closely. After the initial candling, you can wait until day seven to candle your eggs. Candling too often can create temperature shifts for the eggs that could impact their development. And before day seven there isn't much to see, anyway. After candling on day seven, you can wait another week and candle again on day fourteen. Avoid candling from day sixteen or seventeen up until the eggs hatch, as moving or shifting eggs this late in development could harm them.